After our day at Animal Kingdom, we drove back to Wilderness Lodge, and our last night at Walt Disney World *cries*. We have absolutely loved staying at this resort, and would definitely stay here again. 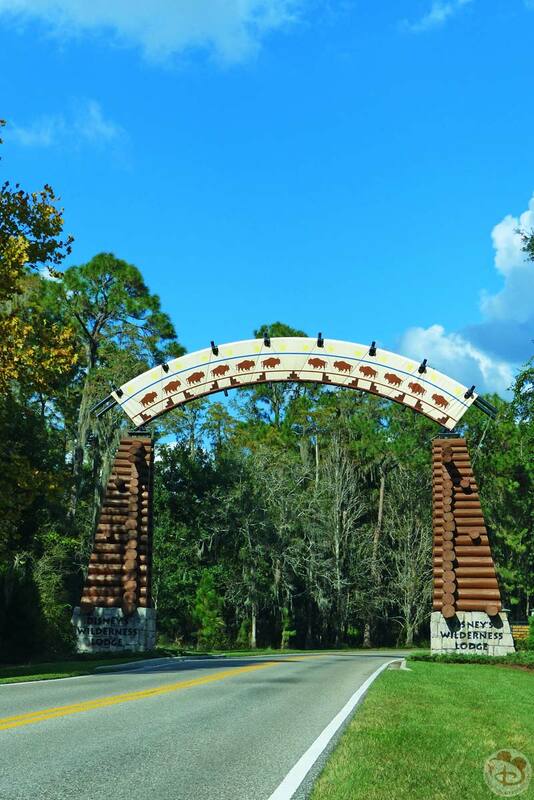 You can read more about Wilderness Lodge in day 3 of this trip report. 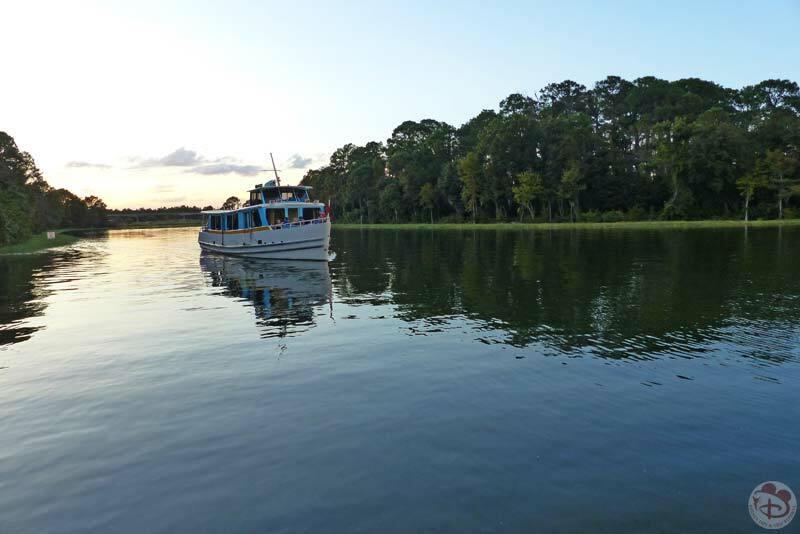 Instead of driving round to Grand Floridian Resort & Spa for our dinner reservation at Narcoossee’s, we took the boat from Wilderness Lodge to Magic Kingdom, then one of the smaller resort boats to Grand Floridian. 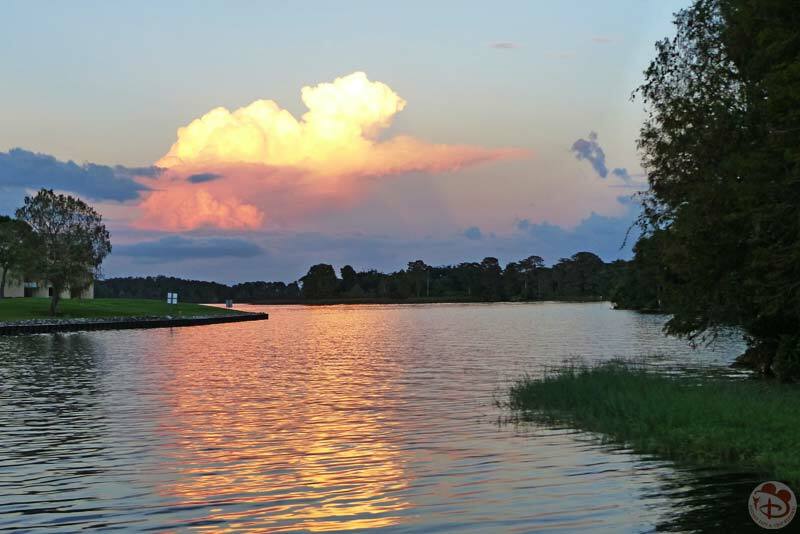 By now the sun was setting, and it was a delightful boat ride across the water. 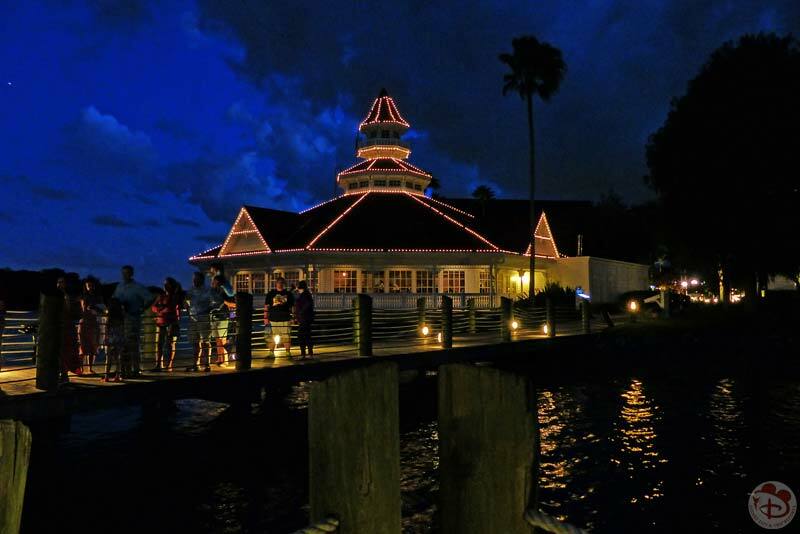 Don’t underestimate how long Disney transportation can take – by the time we reached the dock near Narcoosee’s, it was dark! 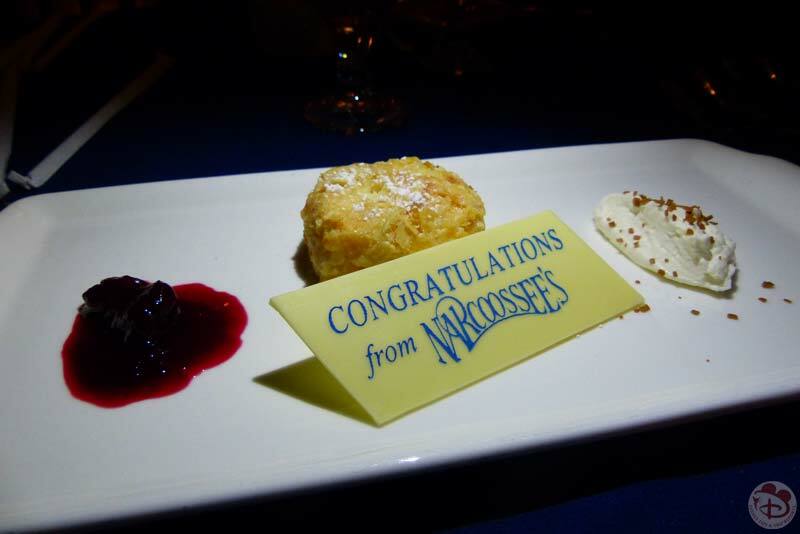 We dined at Narcoosee’s in 2014, when we had our first time on the Deluxe Disney Dining Plan. We decided to eat here on our last night, so that we could easily get over to Magic Kingdom to watch Wishes, and to see Cinderella Castle lit up with lights for Christmas. Unfortunately, we didn’t get to do this, as by the time we left the restaurant, there was thunder and lightning, and we didn’t want to take the chance of the fireworks being delayed – we still had packing to do before our departure in the morning! 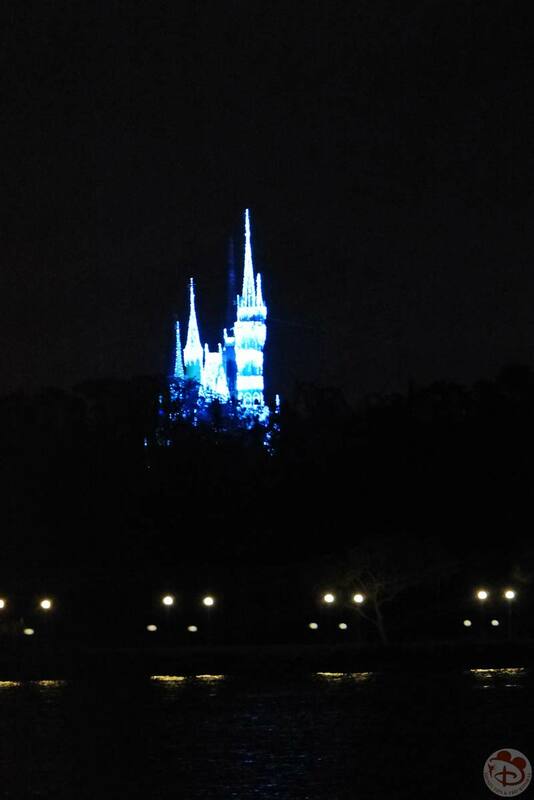 So I only got one rather crappy photo of the Castle; but we do plan to go back in the future for the holiday season. 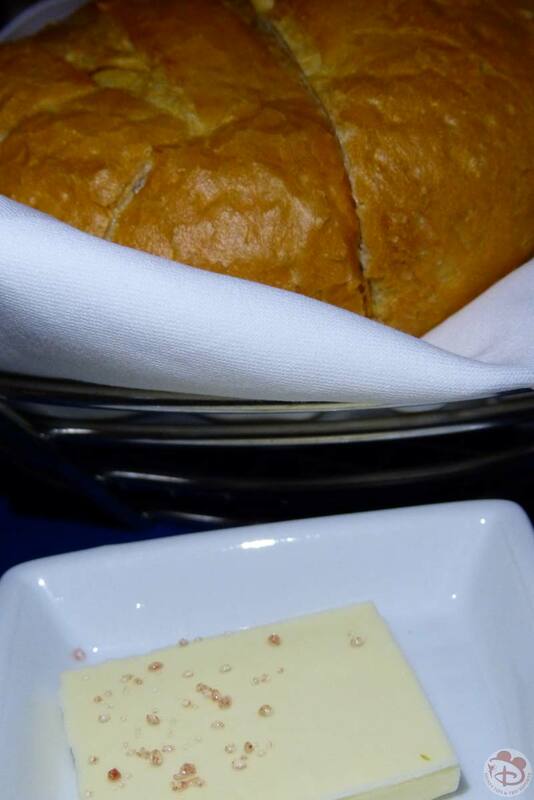 Signature dining seems to always come with a bread service. Which bread and butter you receive, depends on the restaurant. 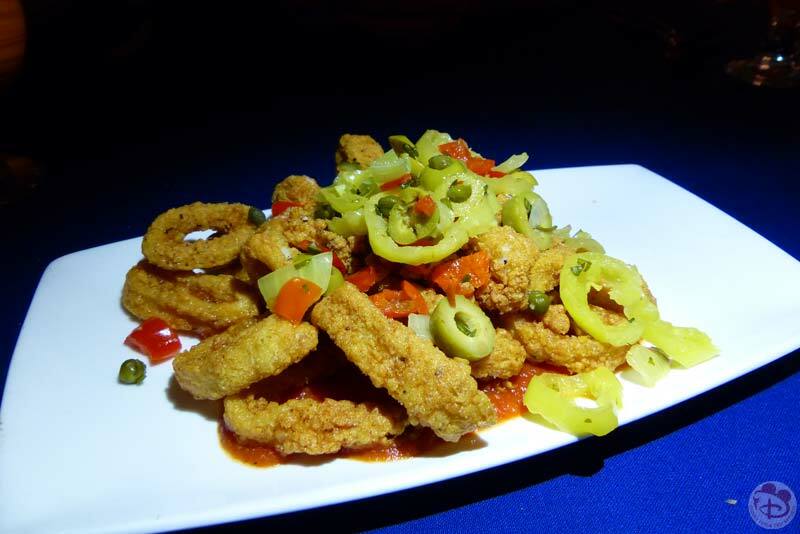 Presentation on my calamari wasn’t the best, compared with the other two dishes, but all tasted good. The shrimp and grits was the tastiest of all three – we’re a family of sharers you see, so I know this to be true, even though it was Steve’s dish! For the main dishes, I don’t actually have a photograph of the menu. I remember the server said he would let us take it home (they print them daily I believe) so I didn’t have to worry about remembering what we had. But then he forgot… so I’m having to judge from the most recent menu from the Disney website. It would seem the Surf ‘n’ Turf that Liam and I had isn’t on the menu any more as a combination. 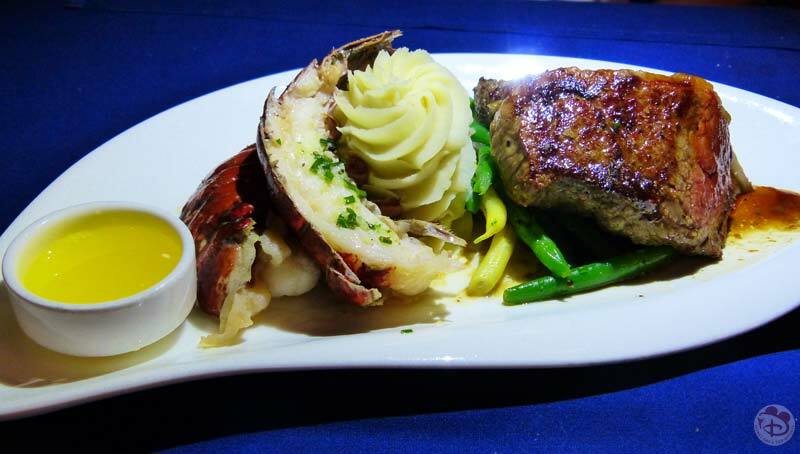 You can still buy steak, and add on a lobster tail – but combined as a meal on the dining plan is not longer available – boo! 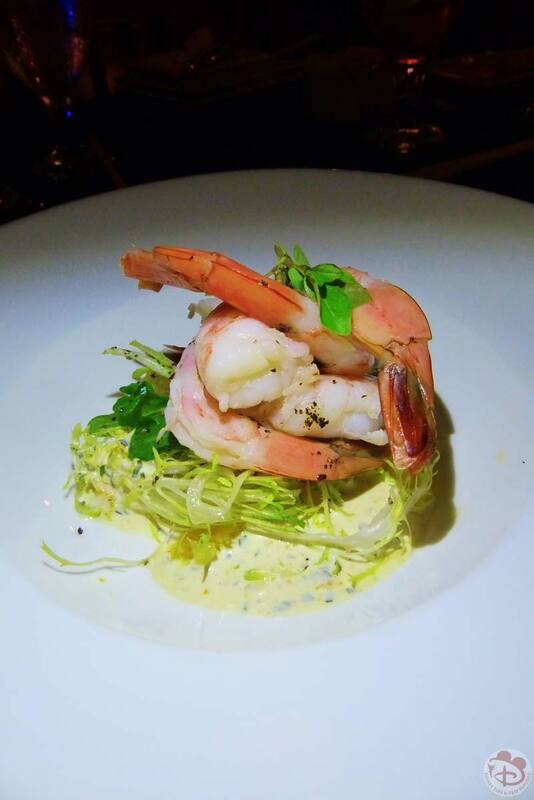 I’m taking the description for the Surf ‘n’ Turf from 2014’s menu, because I had exactly the same dish that year! 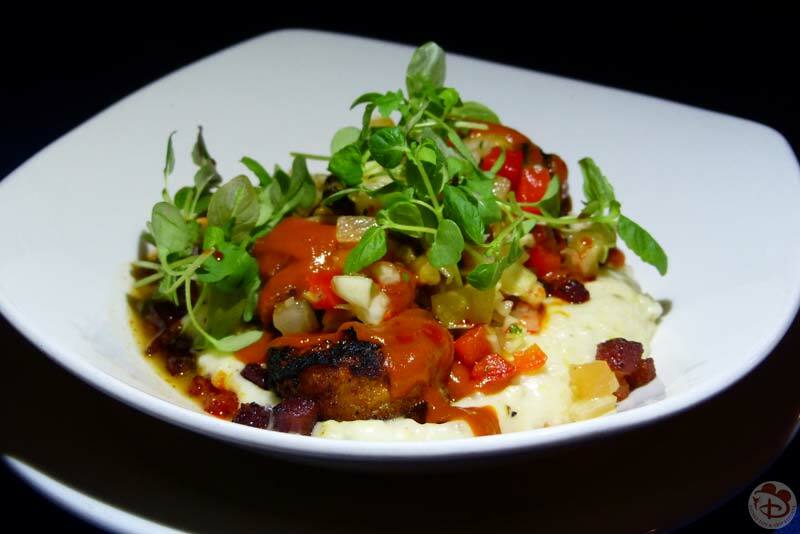 You could have this dish with either filet or New York strip steak. 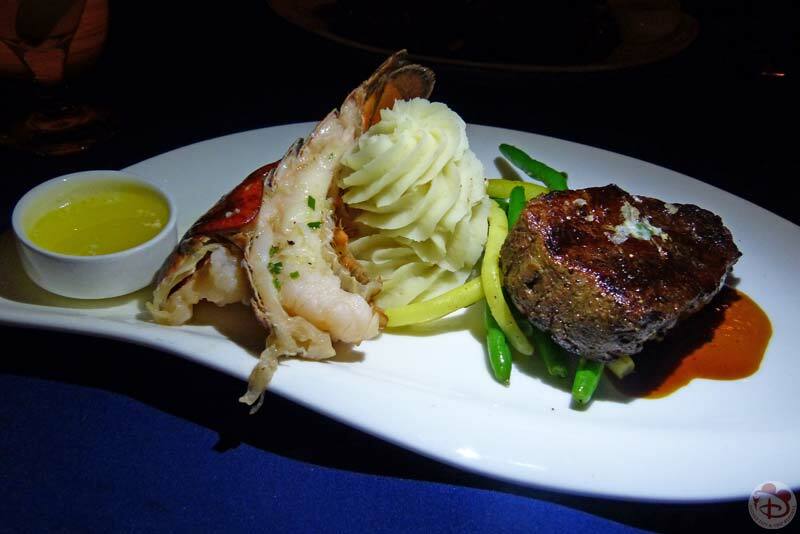 Just as before, the steak and lobster was very good. What a shame they’ve removed this as an option for those on the dining plan. 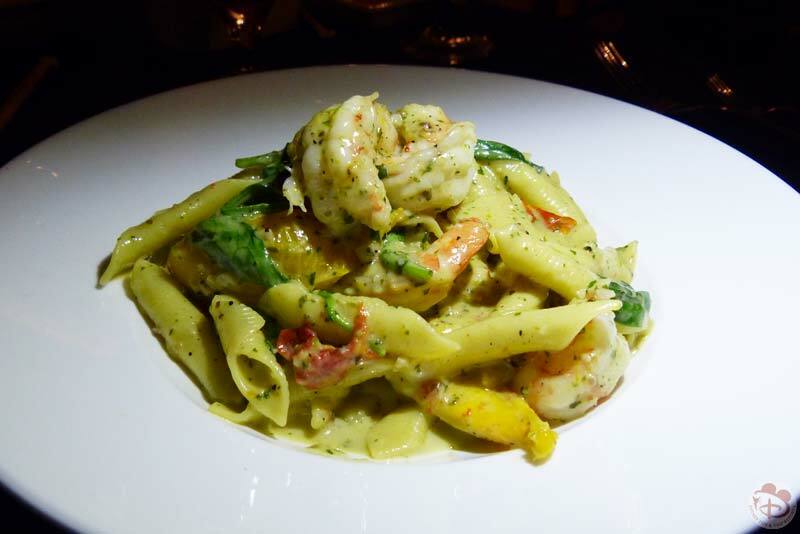 I know Steve wanted to have a lighter meal, which is why he chose the pasta dish. 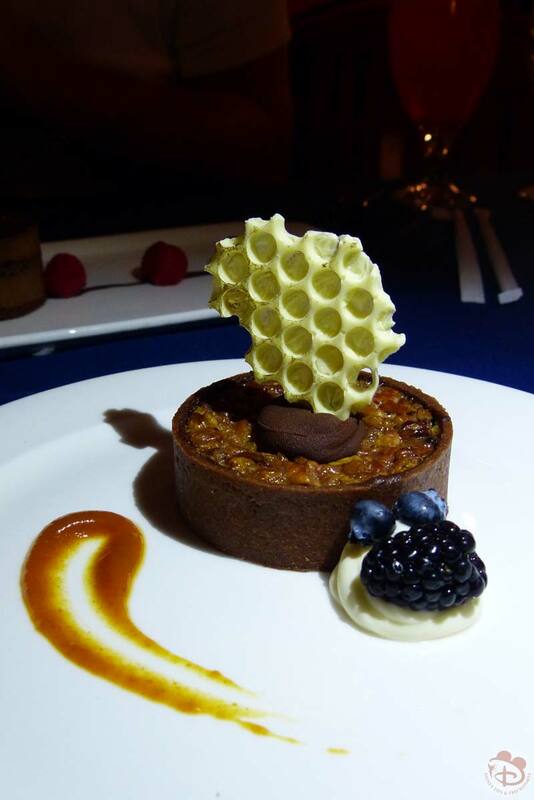 I’m pretty sure that my dessert was a seasonal one – it was so good! 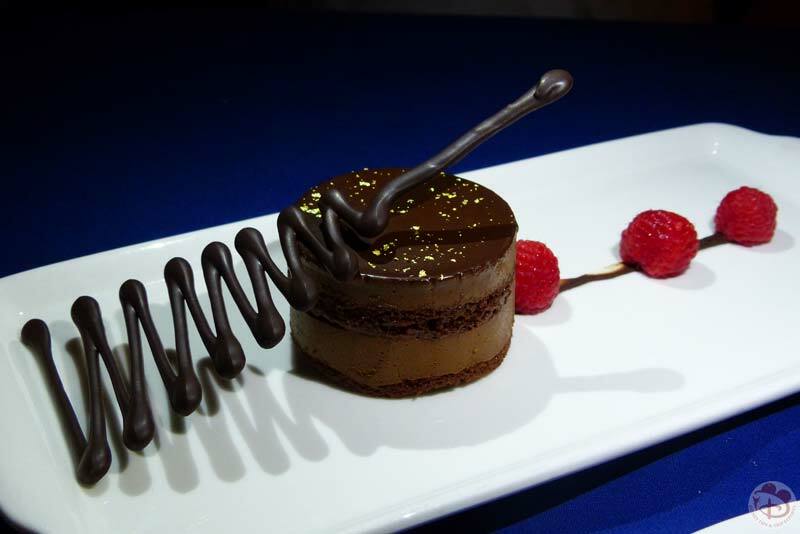 Steve again wanted to say on the lighter side of things, so picked the no added sugar dessert, which look so pretty on the plate. 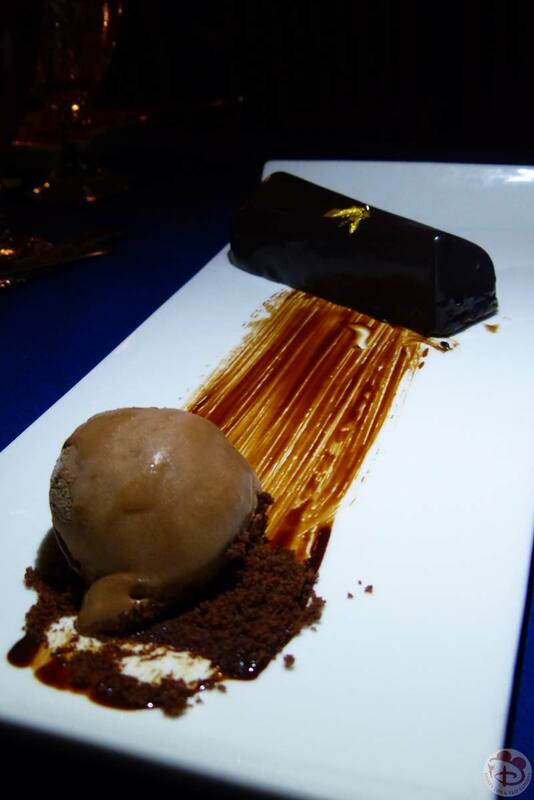 The same can’t be said though for the Candy Bar that Liam had… we all giggled like immature brats at the presentation! Just scroll down, you’ll see what I mean. For some reason, our server felt that he had made some sort of mistake during the service, and by way of apology brought an extra dessert in the form of the cheesecake. We’d mentioned that it was soon to be our 10 year anniversary (the following week) so there was a little white chocolate plaque on the plate too. Overall the meal was delicious (but pricey – thank God for the dining plan!) and a nice way to end our 2015 holiday. As I said at the top of this post, we had planned to go and watch the fireworks in Magic Kingdom, but it was not to be. Tomorrow is the final day (at last, and a year after it happened!) for this trip report. We spend some time at Magic Kingdom before flying back home to the UK.